Some could and actually do make a compelling argument that Newark is the crossroad that has come to describe the melting pot that is our country. We are and have been home to just about every ethnic group this country has welcomed. With these distinct people also came the culture that we think binds us, music and food. People argue tastes in music for days, but when it comes to food there is one thing I have never heard people argue about: BARBEQUE. Now I'm not talking the distinctions of bbq, I'm talking about the indisputable fact that this country is built on pleasures of roasting, smoking, and grilling your favorite food, only to lick your fingers in enjoyment after it is all said and done. It is distinctly and undeniably American. So for the 1st time since fires unfortunately laid claim to our city's 2 last standing American BBQ joints (JT's & Brothers), we have a newcomer set to grace the stage. We sat down with the owner of Dinosaur Bar-B-Que, John Stage, to discuss his past inspirations, present success, and future aspirations as a member of our community. Born and raised in New York City, before relocating to Syracuse, John is a resident of Harlem, who lives what he preaches. His sermon is a mix of motorcycles and barbeque, constantly serving both passions. John got the idea after a road trip below the Mason-Dixon, where he found his true calling amongst the storied roads in Memphis. Starting the business with a mobile operation in the early '80s, John eventually parked the biz permanently in downtown Syracuse. Ever the urbanite, John expanded to smaller cities before taking a chance on Harlem and eventually Troy (NY). After a meeting at an event, at which Dinosaur was the caterer, members of Mayor Booker's team convinced John to take a look at Newark for a possible 5th location as far back as 2008. Their persistence paid off. John says the brand, which includes a mobile operation at different festivals and a line of sauces, has been so successful due to all of the right elements coming together: great food, at a competitive price, served in an authentic atmosphere by a dedicated staff. With that in place, he knew that with the beautiful historic building that the restaurant calls home and the southern influence of our community members, he had found the right place. And the right place it shall be if what John has in store for the Newark location is any indicator. Besides his "holy trinity", beef brisket, pulled pork shoulder, and the ribs, the team is cooking up a few gems for the new market (no pun intended). And we aren't talking wings. Here's a taste: Korean BBQ short ribs...black eyed peas salad...New Orleans BBQ shrimp...BBQ lamb shoulder...New Orleans gumbo. Wait, did he say sandwiches are going to be served on LOCAL Portuguese rolls and that he will be smoking local sausages!? 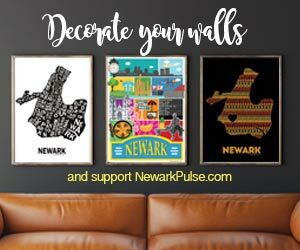 The pulse of Newark is already breathing life into this venture. As John put it, "service makes food taste better." Dinosaur has committed to hiring members of our community, setting up a human resources shop in a vacant retail space, only a few doors down from its establishment. John is promising to deliver a place where he would "personally hang out," with "high hospitality," and to be "part of the community." Besides daily lunch, the barbeque destination will be open on weekends, aiming to close around 11 or 12, due to the fact that they will not feature live music, since the remaining portions of the building will be new residential units. Let us be the 1st and not the last to welcome Dinosaur Bar-B-Que, as it prepares to open its doors to the public on May 8th. Newark and national pride have been in the news quite frequently lately. We conjured images of Whitney singing the national anthem for the nation's largest entertainment event, the Super Bowl. Our mayor went beyond Clark Kent status and donned a cape to rush into a burning building to save one of our neighbors. Now that barbeque is back, we salute...albeit hopefully with sauce on one hand, and a wet wipe in the other.